As expected the Cypriot government has finally reached a deal with the EU/IMF/ECB Troika over the final stage of the restructuring of the Bank of Cyprus (BoC). 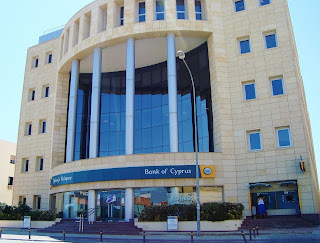 The Cypriot government was keen to limit the haircut and insisted that the BoC only had to reach a tier one capital ratio of 9% at the current point in time. The Troika however insisted that this 9% target applied to the end point of the bailout (2016) and therefore the bank needed a ratio of 12% currently since it will deteriorate overtime. As the Cyprus Mail notes the Memorandum of Understanding signed by both sides clearly fits the Troika view. Unsurprisingly it won out (as always) but the Cypriot government is still seemingly bitter about the whole affair (which doesn’t bode well for the many, many interactions between the two sides yet to come). In the end the two sides settled on a 47.5% haircut for uninsured deposits over €100,000 – although these funds will not be completely lost but converted into shares of the bank. This is above the original target of 37.5% but below the potential limit of 60% (for the most part). “Following the recapitalisation, 12% of deposits that were previously blocked will be released (5% in total). Firstly, this eases the funding transition for the bank as it looks to return to normal operations since it locks in part of its deposit base. Secondly, and more importantly, it locks in a large amount of deposits which would be liable to flee the country as soon as the capital controls are removed (not least because they tend to belong to rich and/or foreign depositors who would likely find it easier to shift their funds). These funds are only likely to be worth around €6bn, so not a huge amount in a country with a deposit base still around €50bn and far from enough to settle the question of capital flight once the controls are removed. But it suggests that both Cyprus and the Troika are planning for an exit from capital controls and looking for ways to stem the potential outflow. The quicker this can be done in a managed way the better for the Cypriot economy. As we have noted before, as long as the capital controls apply the hope of a recovery is slim to none in Cyprus and the euro continues to look incredibly fragmented. (Note: the blog has been updated with new calculations. Previously it suggested the total coverted to term deposits would be €2bn, however, it is likely to be closer to €6bn). UPDATE (19:20): Supreme Court prosecutor Antonio Mura has just requested that Berlusconi's public office ban be cut to three years. The four-year prison sentence should be upheld, he said. A very interesting development, although the Supreme Court would obviously be free to uphold the entire five-year ban if it wanted to. As we noted in our blog post from this morning, we will have to wait until tomorrow (or maybe even Thursday) before the final verdict is read out. The final hearing of Silvio Berlusconi's tax fraud case (the so-called 'Mediaset trial') has started in Italy's Supreme Court this morning. However, according to the Italian media, the verdict is likely to be read out tomorrow - or even on Thursday morning. 1. Which trial are we talking about? And where are we at? We are talking about the so-called Mediaset trial, where Berlusconi faces tax fraud charges. The former Italian Prime Minister was found guilty by both the first-instance court and the Court of Appeal. He was sentenced to four years in prison and a five-year ban from holding public office. Therefore, he appealed to the Supreme Court. The Supreme Court is Italy's highest court, meaning that Berlusconi would have no more appeals left if the conviction were upheld. 2. But he can still be acquitted, right? Of course. The court can decide to clear Berlusconi completely. Or it can rule that the case must be re-examined by the Court of Appeal. This would increase the likelihood that the tax fraud charges against Berlusconi time out - since Italy's statute of limitations would kick in at some point during the late summer of 2014. 3. 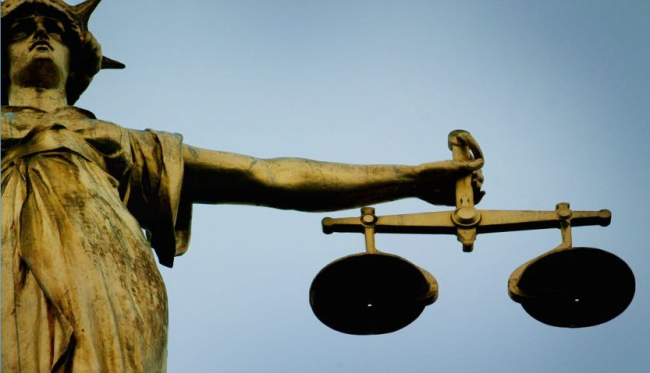 What happens if the Supreme Court upholds the conviction? Would the sentence be immediately effective? No. Berlusconi is a Senator, so he is protected by parliamentary immunity. Therefore, a vote in the Italian Senate's Immunities Committee and a vote in the Senate plenary (most likely through a secret ballot) would be needed before the public office ban can be enforced. Berlusconi's party could be easily outvoted in both cases, but the outcome would be far from guaranteed in reality - not least because Berlusconi's party could threaten to withdraw its support to Prime Minister Enrico Letta's coalition government if the votes go 'the wrong way' from its point of view. 4. 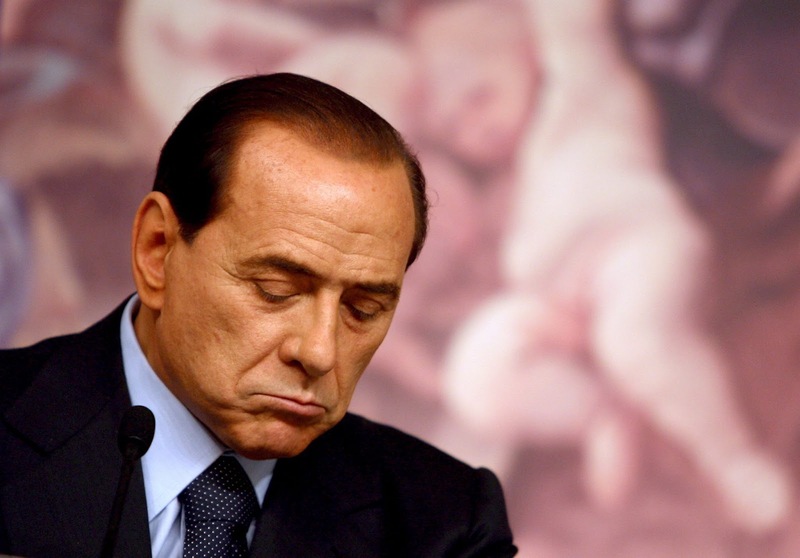 Would Berlusconi be likely to spend any time behind bars? No. If the four-year prison sentence were upheld, three years would be remitted anyway due to an amnesty law passed by Romano Prodi's centre-left government in 2006. This would leave Berlusconi (a 77-year-old man) with only one year to serve - making either house arrest or community service the most likely options. 5. Okay. Now, let's assume the Supreme Court upholds the tax fraud conviction and the Italian Senate rubber-stamps the public office ban. Berlusconi has to resign and is banned from holding public office for the next five years. What happens to the Italian government? The short answer is, "Nobody knows". Several senior members of Berlusconi's party have evoked drastic retaliation (withdrawal from government, resignation en masse of Berlusconi's MPs and Senators, snap elections, and so forth). The truth is Il Cavaliere would make the final decision - and his party would then almost certainly follow the leader. Sure enough, there would be the potential to trigger a political crisis in Italy. 6. Could this be the end of the line for Berlusconi's political career? Not entirely. Even if served with a five-year public office ban, Berlusconi could continue to lead his party - although he would not be allowed to stand for election. 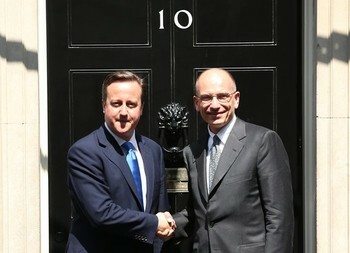 As usual, we recommend you follow us on Twitter @OpenEurope and @LondonerVince for all the updates from Rome. As we reported in today’s press summary, there has been an interesting development in the push for greater transparency at the ECB. This is something which many (including ourselves) have supported for some time (see here for a House of Lords report from 2003 which provides an interesting discussion of the issue), particularly during the crisis where the opacity of the ECB (on issues such as bond purchases, legal documents and potential policies) has at times caused confusion and uncertainty. It has also hampered the accountability of the ECB and its members despite the bank playing a central role in the crisis resolution. It allows the ECB to provide further detail about its decisions and what the key motivating factors were. It highlights the discussions of various options which the ECB may be considering to combat the crisis, this could help telegraph future action and impact market sentiment without the need for an actual decision to be taken. It will demonstrate the weighting of support within the council for certain policy options, again providing further detail on likelihood of future actions but also the strength of feeling on various policies (i.e. a clearer picture of the dovish or hawkish nature of the council). Can be used to communicate concerns to the market and other policymakers which may not have warranted inclusion in the monthly press conference of the ECB President Mario Draghi. Furthermore, if published with a delay, can allow for reflection on the impact of different policies. Essentially, it provides a further tool in the arsenal of the ECB to help communicate with markets and achieve policy goals. As we have noted, the ECB has recently looked increasingly policy constrained and so any additional tool would likely be welcome. All that said, the impact of this tool should not be overplayed. It is ultimately a small aspect of overall ECB policy, its main benefit is that it can provide further nuance to some of the blunter instruments (interest rates etc.). From an outside perspective it could provide a much needed insight into the decision making process – although this will ultimately depend on the credibility of the minutes (will they really reflect the true nature of the discussion) and when they are released. On top of this, FAZ is reporting this afternoon that the ECB and national central banks will publish more details on the notoriously secretive Emergency Liquidity Assistance (ELA), although the article seems to suggest they may only release the framework or rules of ELA rather than details on its practical use and application. Still this would be a welcome, if small, step towards transparency. Some steps towards greater transparency then, however, the underlying motivation seems more likely to be to give the ECB another tool in its new communication strategy rather than increasing accountability as an end in itself. 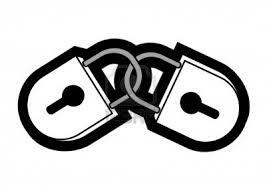 Either way greater insight into the opaque institution playing a key role in the crisis should always be welcomed. 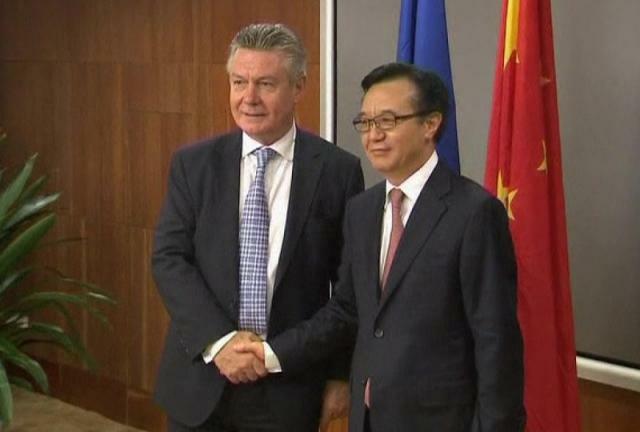 China and the EU have finally reached a deal to settle their trade dispute over solar panels, which has lasted for almost an entire year and has escalated significantly over the past few months. Price floor of 56 euro cents per watt on European imports of Chinese solar panels. Broadly seen to be around the average price which Chinese solar panel producers have been selling out over the past two years and well below the 80 cents which EU ProSun, the group which launched the complaint, were seeking. A limit of 7 gigawatts in capacity imported from China. The total capacity of the European market is thought to be between 10 – 12 gigawatts, of which China currently controls a sizeable majority. This may provide some limit to Chinese control of the market and carves out a chunk for European producers. China has agreed to freeze its investigations into European wine and polysilicon according to European officials. Given the original size of the proposed tariffs (50%+) it does seem that the EU’s Trade Commissioner Karel De Gucht has softened his stance substantially (although this has been happening for some time). This is likely due to the erosion of support for the case in some of the key member states – first Germany (which was never particularly enthused by the idea) and then the Mediterranean states (once China launched its investigation into European wine exports). China’s agreement to drop its (largely) retaliatory disputes provide little cover for the aforementioned change in position. It seems the most important factor for EU officials was the cap on the capacity which can be sourced from China. This could prove to be important, but it still allows China to maintain control over a large majority of the market. 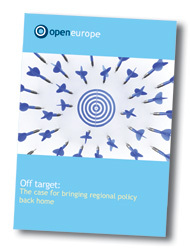 It also suggests an implicit assumption that European producers can control the rest of the market (far from guaranteed if other emerging market producers see an opportunity to fill the gap created by the cap) and that the market will continue to grow, which European producers will be able to take advantage of – again far from guaranteed with the eurozone crisis and a struggling renewables sector in Europe. This may though not be the last word in this dispute, after EU ProSun said it will challenge the deal at the European Court of Justice (ECJ). This could take some time to run its course, but as we noted when the dispute started, ostensibly, Chinese solar panel producers do receive huge government subsidies. By the letter of the law then, its possible the ECJ could side with the European producers. Despite these issues, it’s clear that neither side could really afford to continue with this dispute. The more interesting question now is where this leaves the remaining 17 EU trade disputes which involve China. Has the balance of power shifted? Has De Gucht’s position been undermined by intergovernmental disputes? Ultimately, this may be determined by progress in a new investigation into Chinese dumping in the telecoms market. Watch this space. 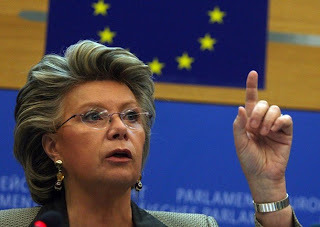 EU Justice Commissioner Viviane Reding has been mentioned as the potential nominee of the European People's Party for the post of Commission President when Jose Manuel Barroso steps down next year (of course, gaining the approval of EU leaders is another matter). One national capital that won't be queueing up to endorse her is Budapest, following Reding's escalating row with the Hungarian government over the country's changes to its judicial system, which it has been claimed allow for too much political interference. A bitter sub-plot in this argument has been the fate of Francis Tobin - an Irish national found responsible for a fatal road accident in Hungary in 2000 - whose extradition the Irish Courts have refused to sanction despite the issuing of a European Arrest Warrant. Reding seemingly backed the Irish position, claiming she was "not surprised" by the decision. "These actions and lies of Viviane Reding cause great harm to the public image and reputation of the European Commission. 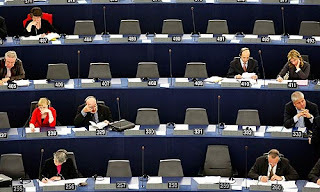 Viviane Reding is either extremely ignorant, or she is lying out of political interests." "We call on her to make the data on which she has based her attack public, or failing that, to make an immediate apology." 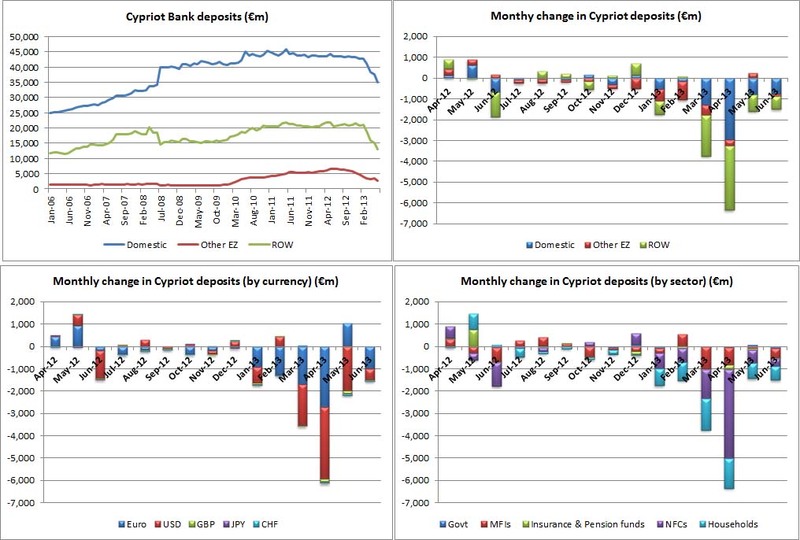 The latest Cypriot deposit statistics seem to be out and there are some strange goings on. We say seem to be, since there has been no press release but the July data release (which corresponds to June data) is up on the website in the usual place. As the graphs below show, the outflow has continued, but there are some questions as to the extent of the outflow. Firstly, the headline stock figures show a further outflow of €5.3bn, this is shown in the top left graph. However, all the flow figures suggest an outflow of €1.5bn. This is similar to the amount seen last month (although this data has been updated and there seems to be some mismatch between the exact spread of outflows, which adds to the confusion). "July 2013: The data for loans and deposits for June 2013 reflect the provisions of the “Sale of Certain Operations of Cyprus Popular Bank Public Co Ltd Decree of 2013”. As from June 2013 Cyprus Popular Bank Public Co Ltd is not considered a Monetary Financial Institution for statistical purposes and therefore, its remaining balances (which were not transferred to Bank of Cyprus Public Company Ltd) are excluded from the outstanding amounts. However, according to the statistical guidelines of the European Central Bank this should not be considered a financial transaction and therefore an adjustment to remove its impact is included under “reclassifications adjustments” with a negative sign." 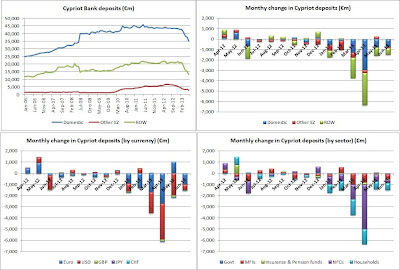 So, this round of data finally includes the merger of the good part of Cyprus Popular Bank (Laiki Bank) into the Bank of Cyprus and the hiving off of the bad bit. There is a big drop in the headline stock of deposits since the Laiki depositors which will be written down have been moved to the bad bank. This bad bank no longer exists as a financial institution. Therefore the money has exited the deposit base since it is no longer part of the financial system. This reduces the stock of deposits but doesn’t show up as a flow since it was simply reclassified. The total amount which has been moved to the bad bank and disappeared into the ether is €3.8bn (i.e. the difference between the headline €5.3bn change in deposit stock and the €1.5bn in monthly deposit outflows). A move which was expected but has been very poorly explained (we attempted to contact the Central Bank of Cyprus to confirm all of the above but it seems they close at 2.30pm during the summer!). All that aside, the outflows are pretty similar to last month in both size and breakdown (split between domestic residents and the rest of the world). Ultimately, money continues to leak out despite the capital controls or people continue to rapidly wind down their savings. Neither presents a pleasant prognosis for the future of the Cypriot economy. 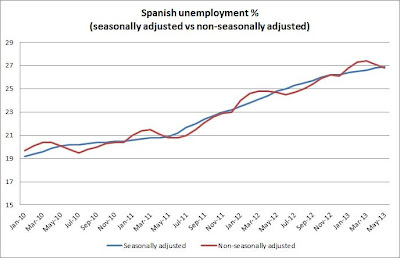 The Spanish National Statistics Institute (INE) has this morning published its latest unemployment data. The headline figures look encouraging. In the second quarter of 2013, the number of unemployed people went down by 225,200 - and is now slightly below six million. The total unemployment rate now stands at 26.3%, while youth unemployment rate is 56.1%. The figures are not seasonally adjusted, so the decrease is clearly linked to the arrival of the summer - when a lot more seasonal jobs are on offer. The two Spanish regions where the number of employed people increased the most were the Balearic Islands (Ibiza, Formentera, Mallorca and Menorca) and Andalusia - top tourist summer destinations. A similar phenomenon took place last summer. The initial, non-seasonally adjusted figures for June 2012 showed a 0.2% drop in unemployment from May 2012. However, once these figures were seasonally adjusted the result was actually a 0.2% increase. The graph below highlights this well, showing that there is a similar dip in unemployment every year when the summer approaches (data are from the EU's statistics office Eurostat, click to enlarge). 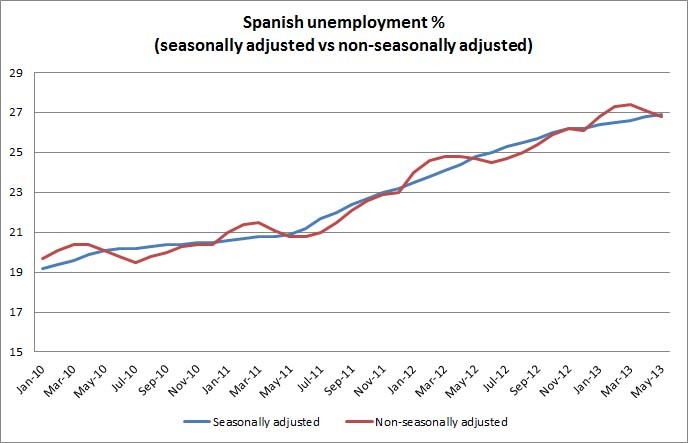 Part of the decrease in the unemployment rate is also due to a reduction in Spain's active population (those working or actively searching for work) - 76,100 people less over the same period. To fully judge the importance of the figures, it is also worth looking at the level of employment which is not impacted by such a change in activity. The figures for June 2013 showed employment increased by only 149,000, much lower than the overall fall in unemployment. A final point to keep in mind is the on-going emigration of Spaniards. This has reached record levels with close to 60,000 Spaniards emigrating in 2012 and many immigrants also moving elsewhere. This is obviously linked to people dropping out of the active labour force. We may well see future declines in unemployment but they will be meaningless if they simply arise from less people actively searching for work or moving abroad to find work elsewhere. Unsurprisingly, the Spanish government had predicted "good" data - and will probably hail the new figures as a success of its policies. But once the summer is over, as happened last year, the figures may ultimately tell a rather different story. There has been a lot of chatter this morning about the eurozone recession coming to an end following the release of the latest Markit Purchasing Managers’ Index (PMI) - a set of indicators used to measure the economic health of the manufacturing and service sectors. The index reached the highest level for 18 months and pushed past the point where it was continuing to decrease (see the relevant graphs below). The average for the eurozone has only just pushed into the positive territory and remains closer to being flat. This suggests that GDP may have stopped contracting but has flattened out rather than returning sharply to growth. Furthermore, this is an aggregate figure. In fact, the PMIs for many countries are still contracting – France included (see right-hand graph above). Given that this crisis is much more about divisions between countries than the aggregate as a whole, such gaps remain important. In fact, with Germany posting strong results, the gap between the strongest and weakest may grow. This could create tensions for future ECB policy. 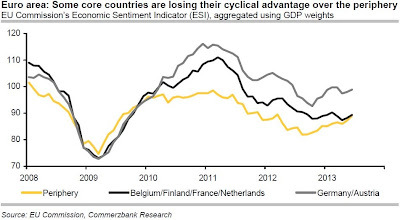 As the graph above shows (courtesy of Commerzbank) although some of the peripheral countries are doing better, concerns are now growing about some of the semi-core and even core members, such as France. 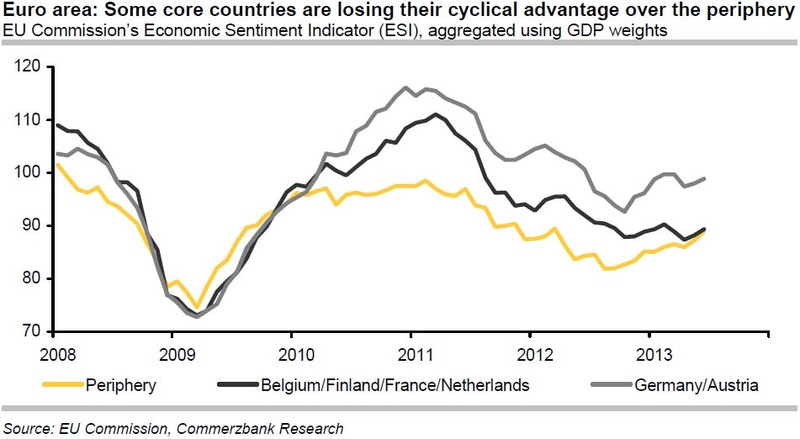 The economic sentiment and outlook in these countries remains worryingly bleak. For France in particular, questions need to be asked about how useful the PMIs are as an indicator give that they have been contracting for some time but GDP has remained fairly flat – i.e. they have detached from one another. It’s not clear any turnaround in PMI will show up in GDP. PMIs represent the private sector. Other components of GDP, in particular public spending and investment generally continue to fall. Even if the private sector is growing, it may not yet be enough to offset this. In many countries the private sector growth is also tied in close with export growth and an external recovery – this remains fragile (see for example the corresponding PMIs for China which fell sharply). Other indicators also suggest that the difficult environment will continue for some time. The ECB’s bank lending survey also out today highlighted that credit to the real economy continues to contract, albeit at a slower rate. Consumer confidence released yesterday did show a large jump but remains well below its historical average in depression territory. A slight turnaround was widely predicted for the second half of this year and so may be largely priced in when it comes to borrowing costs and stock markets (not least because the latter seems to continue to outstrip the macroeconomic fundamentals). Finally, it's worth remembering that political uncertainty in southern eurozone countries can return at any point in time these days (see our previous blog posts for the latest from Portugal, Italy and Spain). All that said, it is easy to pick holes in any single piece of data. The positive turnaround is good for the eurozone, but it is only one indicator and time will tell whether it can amount to a sustained improvement. Given the many obstacles which the eurozone has failed to address this still seems a very uncertain prospect to say the least. On Monday, Eurostat released its latest figures on public debt to GDP, which soared to a record of 92.2% in the eurozone in the first quarter of this year. Of all the eurozone members, only Germany and Estonia were able to reduce their debt levels in the first three months of 2013, while in total five eurozone members had debt-to-GDP over 100%. High government debt is obviously a well-covered issue and a well-known problem in the eurozone. However, the debt problems extend well beyond this simple figure - we've touched on this previously, when looking at the level of financial sector debt and the need for a eurozone banking union. Another potentially interesting aspect of the debt problems relates to what is known as 'implicit debt'. This is an estimate of the future debt which states will accrue including contingent liabilities such as pension payments and welfare payments (many of which are, at this point, unfunded). In that vein, we thought it would be worth looking back at an interesting study produced by German think tank Stiftung Marktwirtschaft in coordination with academics at the University of Freiburg at the end of 2012. 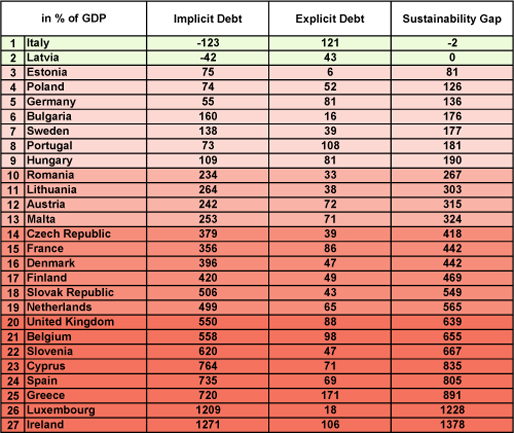 They've had a go at calculating the level of 'implicit debt' in the EU and what it means for debt sustainability. The results are laid out in the table below. ('Implicit debt' is calculated using data on future GDP growth as well as on the long-run change in age-dependent expenditure, using the European Commission’s reports on ageing, all done assuming no policy changes and put into 'present value' terms). As with any such calculations, there are numerous assumptions and we must be wary of drawing grand conclusions, but the results provide some interesting points nonetheless. At the bottom of the debt sustainability ladder, we see the usual suspects such as Greece, Cyprus, Spain and Ireland (raising some questions about how effectively it is really recovering from its crisis). Slovenia, a country which we warned may be in line for a bailout, also finds itself in trouble by this metric. Surprisingly, Luxembourg fares very badly; the authors suggest this is down to its "generous" pension system which has not been overhauled to deal with future demographic developments. It may also surprise many that Italy ends up top of the table. The authors suggest that this is due to the fact that the country "expects only a small rise in age-dependent expenditures as a proportion of GDP." Italy admittedly made quite an effort already in reforming its pension system (in the 1990s and more recently under Mario Monti's technocratic government) but this outcome does seem fairly optimistic, not least because it is reliant on Italy maintaining a long term growth level of close to 2% per year. All that said, another study, by Société Générale, on the topic of "unfunded liabilities" relating to pension and welfare costs, places Italy's at 364% debt of GDP suggesting it is better off than France (549%) or Germany (418%). Similarly, by the SocGen method, Spain would only have a burden of 244% to GDP, showing that a lot depends on the precise calculation and what is included. Perhaps a bit worryingly, the UK is doing worse than most eurozone countries in both calculations. According to Johan Van Overtveldt, the editor-in-chief of Belgian magazine Trends who flagged up these results, "These figures are taken very seriously by the ECB". With regards to Italy, he warns that "an increased interest rate or a continuing recession (or a combination of the two) can quickly and drastically overturn this positive image". In any case, these figures provide some added depth to the on-going debt issues in Europe and debatedly provide a slightly more complete picture than the simple headline debt to GDP figures. As we have noted before, though, this is simply one aspect of the varied and complex eurozone crisis which extends beyond just government debt to the banking sector and international competitiveness (to name but a few areas). 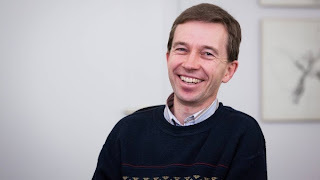 Our German-based partner organisation Open Europe Berlin has published on its blog an exclusive interview with Professor Bernd Lucke - founder and leader of Germany's new anti-euro party Alternative für Deutschland (AfD). We have translated some of the most interesting bits. Bernd Lucke (BL): The root of all evil is, in my assessment, the fact that the European Treaties did not provide, and do not provide until today, for the possibility to withdraw from the eurozone...Since leaving [the euro] as a last resort was excluded from the outset, the possibility of exerting political pressure on member states was also limited. Despite non-sustainable economic development in some countries, the financial markets obviously did not pick up on the large differences [between eurozone countries], which affected the risk of credit default. In turn, the low interest rates 'funded' these developments. Actually, the alarm bells should have been ringing in view of the different developments in country-specific inflation rates, unit labour costs and trade balances. Also, the housing bubbles in Ireland or Spain should have been recognised and counteracted upon by politicians. However, warning systems were not available. It was revealed how ill-conceived the introduction of the euro was, under all aspects. 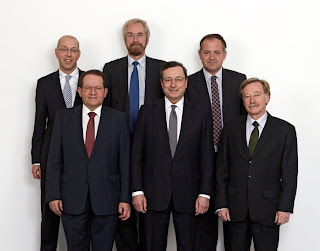 BL: The ECB is not directly to blame because it was simply a part of the poorly constructed euro system...In the time before the crisis, the ECB could have been blamed at most for not pointing out the dangers associated with different inflation rates in the euro countries...Just a note: an independent central bank is good. But a central bank – like the ECB – that is no longer subject to state or democratic control and has switched to self-preservation mode is extremely dangerous. BL: The ESM is ultimately a giant institutionalised eurobond, and therefore a form of debt mutualisation...What we want as AfD is...the return to the Maastricht criteria, and in particular the re-introduction and strict compliance with the no-bailout clause. No country shall be liable for the debts of other countries...Countries should and would go bankrupt, which would reduce the partly unbearable debt levels. BL: As an ‘immediate measure’, we demand the consequent compliance with the [existing] rules of the European Treaties as well as adding a euro-exit clause to the rules. If necessary, we want to force this right to exit by blocking future ESM loans with a German veto. Without further assistance loans, the crisis countries would decide that it is in their own interests to exit the monetary union. This should happen in an orderly and gradual [manner]. On the legal side, the European treaties need to be changed. We have parliaments and governments for that. And Germany has enough weight to push this through. The latest Eurobarometer is out, and as per tradition, the European Commission does its best to spin the findings of a survey that, particularly since the eurozone crisis broke out, hardly makes for happy reading. The press release accompanying the latest Eurobarometer carries the headline, "A greater dose of optimism", which is justified by the fact that "those saying they are optimistic about the EU's future outnumber those who say they are pessimistic in 19 out of 28 countries". The number of those who "tend not to trust" the EU is again at 60% - a +3% increase from the previous survey. The total figure includes 83% of Cypriots (+19% from the previous survey), 80% of Greeks (-1%), 75% of Spaniards (+3%) and 71% of Portuguese (+13%). To be fair, the level of confidence in national governments/parliaments in these countries is even lower - but that shouldn't be of great consolation. On the question "do you feel a citizen of the EU? ", a majority (62%) of respondents agree, although in three countries more people disagreed than agreed with this statement. That this includes the UK may not be a big surprise, but that Greece and Cyprus are on there as well shows how badly the crisis management has tarnished the EU's reputation. A relative majority of Europeans have a neutral image of the EU (39%, =), and the proportion of respondents for whom it conjures up a positive image continues to be just higher than the proportion for whom it is negative (30% positive, unchanged; 29% negative, unchanged). Again, in Greece, Cyprus, Spain and Portugal a majority (sometimes relative, sometimes absolute) of respondents have "a negative image" of the EU. Two-thirds of Europeans say that their voice does not count in the EU (67%), a 3-point increase taking this score to its highest level since autumn 2004 when the question was first asked. This proportion has increased almost continuously since spring 2009, from 53%. Only just over a quarter of respondents (28%, -3) agree that their voice counts in the EU. 49% of total respondents don't think the EU "makes the quality of life better in Europe", compared with 43% who think it does. On the euro, public opinion is hugely divided with only a 9% net approval rating - 51%, support it and 42% oppose it. In countries that are euro members approval stands at 62% (down 4% since Autumn 2012) but only at 29% in non-euro countries. UK report on EU foreign policy: Is it working? Is it accountable? How diplomatic are diplomats when discussing a rival? "Many thought it had played a valuable role on a number of issues, such as Iran, Burma, the Horn of Africa, and the development of a comprehensive approach combining a range of instruments"
However beyond the good job / bad job narrative the more important question is to whom are these EU diplomats ultimately responsible? 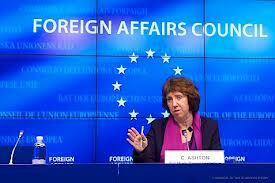 The report talks about the “complex legal and institutional framework for the EU’s foreign policy”. This is a fair observation and one that makes EU diplomacy difficult to hold to account. The report is clear that the European Parliament is not the answer: "If the institutions’ performance does not improve; or if there is an undesirable shift in control away from the Member States, such as a greater role for the European Parliament; how will we alter our approach." The report also notes - correctly in our view - that "the EU lacks the capabilities and the political will to play a major military role.” The EU can never aim and should never aim to be a coherent military/diplomatic actor on the world stage. It cannot do so because it does not have the military capabilities, the wish to pay for them or more importantly the political will to act. Moving onto the issue of external aid, the report notes that "Although policy making at the EU level is often critically important, it can sometimes result in compromise positions that do not give full effect to UK priorities or that lack impact." We have argued that EU aid is poorly targeted, with only 46% reaching low income countries, compared with 74% of UK aid, 58% of EU member state governments’ aid and 56% of United States aid - figures first flagged up in our 2011 report on EU external aid. This is largely a result of the large sums of the EU aid budget devoted to the EU's neighbourhood. The UK report largely glosses over this by only focusing on EU "activities that have poverty reduction or humanitarian response as their central purpose," implicitly reinforcing the point that many of the EU's 'aid' activities do not. At a time when public confidence in overseas development spending is faltering, it is essential that this ‘value for money’ question at the EU level is addressed. "Concerns were also raised about various cross-sectoral EU legislation which has a significant impact on the delivery of healthcare in the UK. Many of these concerns related to proposals around data protection and the Working Time Directive (WTD) – neither of which were specifically designed with healthcare in mind." The main issue is the impact of the EU's Working Time Directive - passed as a 'health and safety' measure, but in reality a politicised piece of social legislation - which has imposed significant additional cost burdens on the NHS as well as messing with the ability of junior doctors to learn effectively on the job. To re-cap quickly, the original Directive imposed a cap of 48 working hours, but this was then followed by a couple of rulings from the ECJ (see here for more details) which made a bad piece of legislation a lot worse by creatively interpreting its provisions concerning on-call time, further limiting the amount of time staff could spend actively looking after patients. The Royal College of Surgeons has estimated that the WTD has led to a loss of 400,000 surgical hours per month, while the BMA has calculated it has led to the equivalent of the loss of up to 9,900 doctors. The total cost of the Working Time Directive to the UK economy currently stands at over £4bn every year, much of which falls on the NHS which has to employ additional staff - many of them locums. A recent Telegraph investigation found that many of these locums were being paid up to £2,000 per day to provide cover. Aside from the (huge) direct financial cost, there is also the issue of trainee doctors not being able to gain the requisite level of experience, with potentially dangerous implications for patient care. The irony is that due to its own inflexibility, the Directive fails to even fulfil its basic premise of ensuring medical staff work sustainable hours - a number of investigations has found many doctors still work dangerously long hours. Wider issues around public procurement and competition law. In conclusion there is clearly a clash between the EU treaties which state that health ought to be a national issue and the real impact of EU legislation on the NHS. In part, this could be due to the unique nature of the NHS compared with other European models but the political reality is that all main political parties are committed to broadly keeping the NHS. However, the report does note that other EU countries 'bypass' the WTD by treating service delivery and education via separate contracts, which suggests its not only the UK that has a problem with it, and that it could muster allies in an effort to force through reforms. Highlighting such problems is exactly the point of the Balance of Competences review and its good that these issues are being brought to light. That said, for the impact to be lasting, this information must be turned into a political strategy and fed into the government's attempts to renegotiate the UK's position within the EU. Such a strategy is yet to be formulated, and the quicker this is done the clearer the impact of such reviews will be. Political stability seems to have returned to Portugal - at least for now. The country's ruling coalition and the opposition Socialist Party have failed to agree on the 'national salvation pact' demanded by President Aníbal Cavaco Silva to help the country successfully complete its EU/IMF bailout programme. Nonetheless, Cavaco Silva said in a speech yesterday that the continuation of the existing centre-right coalition was "the best [alternative] solution" - thus ruling out snap elections. The Portuguese President also stressed that the government would request a vote of confidence in parliament on its future economic and social policy plans. So are we back to square one in Portugal? Not entirely. First of all, there will soon be a cabinet reshuffle - as agreed by the two ruling parties before President Cavaco Silva stepped in. In particular, Paulo Portas - the leader of junior coalition member, the People's Party (CDS-PP) - should become Deputy Prime Minister and be in charge of dealing with the EU/IMF/ECB Troika from now on. This could be an important change. 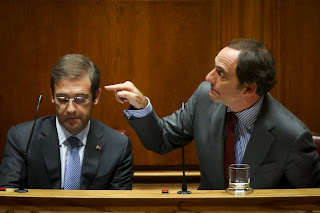 Let's not forget Portas tendered his resignation from the government because he disagreed with Prime Minister Pedro Passos Coelho over the appointment of Maria Luís Albuquerque as new Finance Minister. On that occasion, Portas made clear that he was hoping for a change in the country's economic policy approach (in substance, less austerity). This leads to a more general point, which we already made in the past (see here and here). Political consensus around EU-mandated austerity is shrinking in Portugal, and although the turmoil seems to have passed for now, tensions within the ruling coalition will remain - with Prime Minister Passos Coelho's Social Democratic Party (PSD) clearly more in favour of sticking to the current economic policy course than its junior coalition partner. Furthermore, as Prime Minister Passos Coelho himself admitted this morning, the recent political crisis has "undermined" confidence in Portugal's determination to push ahead with the implementation of its bailout programme - something which could make it more difficult to obtain concessions from the European Commission and its eurozone partners in future. As we noted in our flash analysis on this issue, these tensions have come at an inopportune moment for the country given that it still needs to enforce significant austerity to meet its targets and that its economic reforms to improve competitiveness now look off track. As political consensus wanes and protests increase, these tasks will become ever more challenging. Needless to say, Portugal's return to the markets - currently scheduled for June 2014 - is already looking quite complicated. Further delays or disagreements within the ruling coalition could make things even worse. Double majority: the way to avoid the EU becoming a political extension of the euro? In our 2011 report Continental Shift, we came up with the idea of "double majority", requiring a majority both amongst eurozone members and non-eurozone ones for a proposal to pass. We developed the idea further in a briefing last year. We were told at the time that the idea was dead in the water since, as one Brussels-based journalist put it, it looked like "a straightforward veto” for the UK. We disagreed at the time, as a) there are plenty of ways to organise the double majority principle to make it easier to swallow for eurozone countries and b) the political case for safeguards against eurozone caucusing is strong - Berlin and others know that they are the ones changing the rules of the game, not the UK. Britain has the right to respond. Next week, the UK government will publish its first six reports in its "balance of competence" series, one of which will be the single market. A key question which we hope will be addressed is how do you safeguard the single market in light of further eurozone integration. As we have said repeatedly, the crisis has led (or is potentially leading) to greater integration within the Single Currency, in financial market regulation and supervision in particular. This phenomenon has raised concerns, by us and others, about the potential for the eurozone to ‘caucus’ and impose eurozone solutions on the rest of the EU-28, which could both undermine the single market and/or simply disenfranchise non-euro countries entirely. The exact extent of that risk is unknown - euro countries have their own internal disagreements and there's no clear cut example to date of euro countries caucusing against the UK (bankers' bonus caps, a fight which the UK lost, was more a European Parliament-driven issue). However, even with some eurozone integration, not least with the banking union, the risk is real enough to start thinking about how to be safe, rather than sorry. The ECB, after all, has already demanded that certain transactions cleared in euros must take place within the eurozone, rather than through the City of London. The agreement reached by finance ministers to introduce double majority voting was a good deal for the UK and, again, evidence that reform is possible when pitched as a means of protecting something for all – in this case, the integrity of the single market. It is time to consider whether this principle of double majority voting might be applied more widely, not simply in one EU regulator which interprets and enforces regulation but in the much more powerful Council of Ministers which decides regulation. One way to organise this would be to expand double majority to all laws. If a given proposal going through the Council is seen as either undermining the single market - for example by pushing euro-denominated business inside the eurozone - or discriminating against a country on the basis of euro membership, the double majority principle would kick in. A majority amongst both the "ins" and "outs" would be required for a proposal to pass. How it would work organisation-wise would need to be worked out. For example, who triggers the vote - is it enough for one country to object and trigger the double majority vote? What's clear is that this would be a very effective way to avoid a "not in the euro but run by the euro type scenario" - and again, there may be support for this on both sides of the eurozone divide. We fear that the BoC reports, whilst highlighting the risk, will stay well away from exploring this type of measure (in fact, there won't be any firm policy recommendations). However, we'd be surprised if something along these lines isn't a priority in a future government's renegotiation package. Italian Prime Minister Enrico Letta has probably made a lot more friends than he expected on his first official visit to the UK. This is largely due to a couple of quite sensible remarks he has made about the future of Europe and Britain's role in it. "It can be possible and it could be useful for us too...We need a more flexible Europe...We can have a new [EU] treaty negotiation for the UK to have a different link, but remaining on board, and for Italy or other countries in the euro to have a more integrated eurozone." "I think it will be possible to have a common very near future in which we can have [EU] treaty changes for having a more flexible Europe in the interests of the UK, but also in the interests of Italy and the euro area countries." This certainly challenges the assumption that there's no appetite for major treaty changes across Europe. "Greater integration in the eurozone should not challenge the integrity of the single market or leave countries outside the eurozone less comfortable with their membership of the [European] Union...We need to reshape the Union, so that it can accommodate the interests of countries which want to move forward towards greater political and economic integration, and countries which prefer a co-operation around the single market." Furthermore, during the joint presser, Mr Letta repeated several times that the single market is "the main pillar" of the EU because, unlike the single currency, it is shared by all 28 member states. This is music to David Cameron's ears. Italy is traditionally one of the most pro-integration EU member states, and while Mr Letta believes in the 'United States of Europe', the fact that he also acknowledges the need to make the EU "more flexible" is potentially significant. It means that more integration in the eurozone, if that is what happens, is not incompatible with a more flexible, looser relationship for other countries outside the single currency. "Change in the EU is worth fighting for and that change would not just benefit Britain but every country in the EU." Well, the UK may just have found a new, and somewhat unexpected, ally in this fight. Yesterday the House of Commons voted to opt out of c.130 EU crime and policing measures and then seek to opt back into ones the Government judges to be in the national interest (c.35 at present). These 35 will for the first time become subject to the juristiction of the European Court (ECJ). Given the past history of the ECJ's rulings and the difficulty of amending EU law once (mis)interpreted by EU judges this is no small thing. Many Conservative MPs were rightly concerned and presured the Coalition to first give more time for the Committees to examine these measures and then amend the motion to remove the specific list so as not to prejudge the outcome. We have argued before that the Conservative part of the Coalition faces a difficult decision and given this, it should hold open the probability that ECJ jurisdiction would form a part of a wider Conservative renegotiation of the UK's EU membership terms. So did the Home Secretary do that? Theresa May set out her position on ECJ juristiction claiming "we have pursued a policy of seeking co-operation not control” (incidentally the title of an Open Europe paper written by Dom Raab MP on this issue). She then went on to explain that a Conservative Government would revisit ECJ juristiction. As part of that renegotiation, it would be odd indeed, and colleagues would question it, if the Conservative party, as part of its commitment, said, “We will renegotiate, but not these bits.” We will renegotiate the United Kingdom’s relationship with the European Union. The issues involving justice and home affairs to which I referred earlier are being considered in the Government’s “balance of competences” review. Undoubtedly the jurisdiction of the European Court of Justice will need to be considered when, after the election, a future Conservative Government renegotiate Britain’s relationship with the European Union; but the choice that is before us now is binary. We are a coalition Government with no mandate to seek a renegotiation of our relationship with Europe..
...Before I took a number of interventions, I mentioned the European Court of Justice. I also want to refer to the European Court of Human Rights, which contradicts laws passed by our Parliament, overrules judgments made by our courts, and interprets the articles of the original convention on human rights in an expansionist way. That is totally unacceptable. I therefore believe that we also have to consider very carefully this country’s relationship with Strasbourg as well as our relationship with Brussels. So we seem to be reaching a clear commitment to renegotiate the ECJ's juristiction over EU crime and policing measures. We have long argued that this is right, necesary and achievable but, like the referendum commitment, will it survive any future coalition talks? The EU's structural funds - still heading in the wrong direction? A new report published by the EU’s Court of Auditors yesterday provides an interesting reminder of the failings inherent in the current EU regional policy, whereby the cash is recycled between every region in every member state – irrespective how wealthy – via the EU's structural funds. The EU has allocated around €65bn towards co-financing the construction and renovation of roads between 2000 and 2013, and the ECA report focuses on 24 projects in Germany, Greece, Poland and Spain, coming in at a total cost of around €3bn. The good news is that, unlike in one particularly notorious case in Southern Italy, the money was actually used to build or upgrade roads which “delivered savings in travel-time and improved road safety”. This is a microcosm of the wider problems with EU regional policy. As we argued in our 2012 report on this topic: “There are still a number of problems with the funds, including an unsatisfactory correlation between funding and results.” We also flagged up that, contrary to some of the Commission’s more boastful claims, due to the inability to consider individual indicators in isolation, it was virtually impossible to objectively assess the economic impact of the structural funds. Essentially, project selection across the EU is driven more by the fact that there is a pot of money that has to be spent, and less by the existence of a genuine economic case or by seeking to maximise added value. 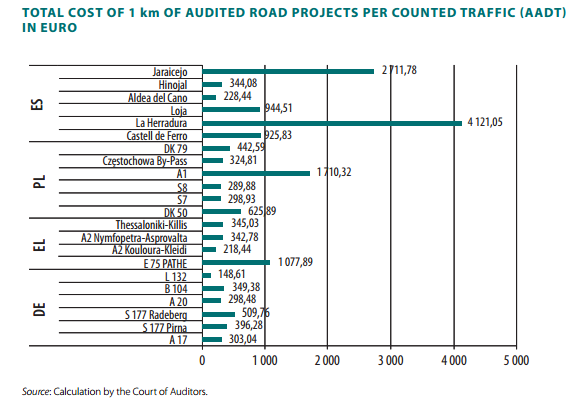 The report also found that the cost of constructing roads varied hugely both between and within countries. Interestingly, the German projects were the cheapest, followed by Greece and Poland, with Spain being the most expensive. Fundamentally, this also illustrates another point we raised in the report – namely that the structural funds come with significant opportunity costs – i.e. where spending leads directly to other, more productive economic opportunities being wasted. For example, the money spent on the La Herradura project in Spain – where actual traffic was 50% lower than planned - could have been spent on a different project with higher economic returns or not raised via tax and sent to Brussels via national governments in the first place. This also underlines another critique set out in the report – that far too much cash from the structural funds has been funnelled into infrastructure construction (some of it clearly not corresponding to a genuine economic need) in the countries most affected by the eurozone crisis – Spain, Portugal, Greece etc. resulting in a number of ‘white elephant’ projects. In wealthier EU countries – and also those most affected by the eurozone crisis – EU structural funds are simply the wrong tool for boosting regional development. While there is a case to be made for continued support to less wealthy member states via the EU budget, wealthier member states could both achieve a much needed financial saving but also regain the ability to tailor the rules to better suit their own circumstances rather than being constrained by Brussels’ one-size-fits-all framework. In the UK, such a move would broadly enjoy cross party support and could save the government around £4bn net over seven years – something for Mr. Cameron (or indeed Mr Miliband) to target during the 2016 mid-term review into the long-term EU budget? The Government has promised more time for Parliamentary committees to report on the proposed ‘opt back ins’ and there will be another vote on opting in, after negotiations with the European Commission and other member states are complete. The Government has also proposed a series of domestic reforms that would improve the functioning of the EU Arrest Warrant. 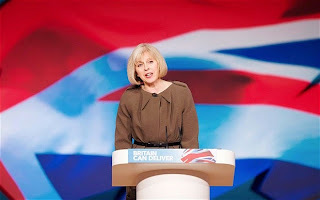 Nevertheless, the Government’s proposal to opt back in to 35 laws, which includes the three most significant – the EAW, Eurojust and Europol – does raise serious question marks about the Conservative leadership’s pledge to renegotiate EU powers. More time for scrutiny is welcome but the risk is that Parliament is presented with a fait accompli after EU negotiations - will MPs be able to vote on individual opt-ins or be presented with a final list as they have been this time? As a statement of intent in future negotiations about EU involvement in this area, opting back into 35 measures seems rather weak. The wider question many Tory MPs will have is whether this closes the book on this area of the UK relationship with the EU for good? They will want reassurances that, after this messy legal and Coalition compromise, a majority Conservative government would seek to reopen the issue and remove all ECJ jurisdiction over crime and justice and return to a voluntary system of practical cooperation. We hear that most Conservative MPs will vote for the Government motion today, and the rebellion is likely to be limited mostly to the usual suspects. The question is: will Tory MPs vote with the Government today because they have faith in Conservative leaders to deliver changes to EU crime and justice cooperation in future, or because they don't want to kick up a fuss? UPDATE (16:00): Another interesting fact from the Rajoy-Tusk presser. When a foreign leader comes to Spain on an official visit, the protocol establishes that, at the joint press conference, Spanish journalists and their counterparts from the visitor's country are only allowed two questions each. Today, it had been agreed that the two questions from the Spanish side would come from El Mundo and the news agency EFE. However, Rajoy unexpectedly gave the floor to a journalist from ABC. Asked by his colleagues at the end of the presser, the ABC journalist explained that he had received a phone call from his editor dictating him the exact wording of the question he had to put to Rajoy - who then replied by reading a short written statement he had prepared. UPDATE (15:00): At the joint press conference with his Polish counterpart Donald Tusk, Spanish Prime Minister Mariano Rajoy said, "I'm going to fulfill the mandate I was given by the Spaniards" - a clear indication that he's not planning to resign. Meanwhile, the first details from Mr Bárcenas's court hearing are emerging. For the first time, he admitted that he was indeed the author of the 'parallel' accounting books published by El País earlier this year (see our blog from last January for further details). Mr Bárcenas reportedly also declared that he made cash payments to Rajoy himself and María Dolores de Cospedal, the Secretary General of Partido Popular, in 2008, 2009 and as recently as March 2010. Remember the slush fund scandal that broke out earlier this year in Spain? 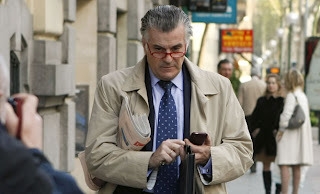 Prime Minister Mariano Rajoy and other senior members of the ruling Partido Popular allegedly received illegal cash payments from the party's former treasurer, Luis Bárcenas (in the picture). All these payments were registered in 'parallel' accounting books that were leaked to the Spanish press (see our blog from last January for further details). After a couple of months of relative calm, the scandal is now reigniting. El Mundo yesterday published several screenshots from Mr Bárcenas's mobile, allegedly showing that Rajoy sent him supportive text messages after the scandal was exposed - the most recent one in March - and asked him to keep calm and deny the existence of the secret accounting books. Unsurprisingly, the opposition Socialist Party has called for Rajoy to resign "immediately" in light of the latest revelations. Equally unsurprisingly, Rajoy's office denies any wrongdoing and accuses Mr Bárcenas of trying to "deviate attention" from his own judicial problems. Crucially, the Socialist Party itself has made no mention of early elections so far. They simply want Rajoy to quit and be replaced by someone else from his party. An understandable position, given how badly the Socialist Party is doing in the latest opinion polls. Therefore, the risk of snap elections remains small for now - although the scandal will inevitably cast a shadow over Rajoy's government, at least until things become clearer. Today, all eyes in Spain will be on two key events: Mr Bárcenas is due to appear in court, and is expected to provide some more details about the latest events. To add a further twist to the story, his lawyer yesterday said Mr Bárcenas didn't know anything about the publication of his exchange of text messages with Rajoy by El Mundo. The Spanish Prime Minister is also due to speak in public, in a joint press conference with his Polish counterpart Donald Tusk - which is also going to be interesting. We will keep a close eye on anything coming from Spain throughout the day, so keep following us on Twitter @OpenEurope and @LondonerVince. On Monday MPs will be asked to vote on the Coalition’s policy to opt out of 127 EU crime and policing measures and then opt back into 35 of them, including virtually all the significant ones. By opting back in the UK will cede ultimate authority to the European Court of Justice (ECJ) over all these measures for the first time. Of the c.100 measures the UK will now drop all (except for a measure on DNA data sharing), are of limited or no significance - as the Government (and the Liberal Democrats) readily acknowledge. We are not opting out of any important EU powers; we are ceding yet more authority to the ECJ. This is the last chapter in the ratification of the Lisbon Treaty. Giving the ECJ power over this most sensitive of areas is hugely significant and fraught with risk. For the first time the UK could be taken to court by the European Commission if it refuses to follow other states’ requests on a wide range of crime and policing activities; sharing data and intelligence, implementing freezing orders, carrying out arrest warrants, and much, much more. Cooperation with other EU (and non EU) police forces is of course a good thing but does not require creating a new legal order and given the history of ECJ political activism, and the fact that these agreements were not written with the Court in mind, it is surely wise to protect the UK’s judicial system by keeping the ECJ out of it. Ceding control to the ECJ could ultimately be costly both financially and more importantly in terms of control over our own law. As the title of Dominic Raab MP’s report on these measures for Open Europe put it, we should aim for “cooperation not control”. So why has the Coalition decided to opt in? To be fair to Theresa May she has had little room for manoeuvre. She has inherited a terrible hand as a result of David Miliband’s appalling negotiation of the Lisbon Treaty. The political genius that was David Miliband realised that ceding control to the ECJ was politically problematic but rather than negotiate a deal which excluded it (as Denmark did) he decided to settle for a time limited exemption. Yes we have a right to opt out but if we use our right we would be out of the existing legislation on cooperation altogether, as we have said: ‘an unavoidable choice’. The choice Miliband gave his successors was between full ECJ control over everything or being thrown out of existing cooperation – a master class in UK diplomacy. To make matters worse Theresa May has had to contend with the Liberal Democrats. For the Liberal Democrats the decision should have been a difficult one. Traditionally in favour of civil rights - the Liberal Democrats campaigned against the UK / USA extradition treaty - you might therefore have expected that they would also have qualms about an EU extradition system under the jurisdiction of an unaccountable EU court. Added to that; freezing orders, evidence gathering and data sharing all at the bequest of a foreign state with not recourse to UK law? However, the Liberal Democrats belief in civil liberties conflicts with their passionate love of the EU integration. It was with no surprise that Danny Alexander, former director of communications for Britain in Europe, and Lib Dem negotiator when faced with a choice between two core Lib Dem beliefs plumped for EU integration over civil liberties. David Cameron was right. We should build protections into our legal system with regards to the EAW. The Coalition has now brought forward amendments that would attempt to do that in some limited cases. The problem is they have no superior force once the ECJ gets jurisdiction. We will be at the mercy of the EU court. The problem is no longer EAW reform it is the new EU legal order. Conservative MPs are well aware of the threat. 102 MPs signed a letter requesting the Government activate the block op-out. They realise that co-operation with our EU partners is possible without getting the EU court involved. We cooperate with a range of states around the world and have done for decades. Crime and policing is not an area that requires EU harmonisation under the ECJ and is not an area the UK should seek to remain in after a renegotiation. To the Liberal Democrats the EU integration is an ‘article of faith’ and an end in itself. They have now got what they want. And if it was right then so let’s say so again now. We should not in William Hague’s words, “let matters rest there." So when it comes to Monday, let’s understand the importance of what is being done, not rush things, give the appropriate amount of time to “line by line scrutiny” of the measures that are being ceded to the ECJ and most importantly when the time comes for a wider renegotiation the Conservative part of the Coalition should make it clear we will not let the EU court continue to have control over our justice system.